Ever since I have been working out in a gym, I can remember people talking about how great sweet potatoes are for you. All the big guys in the gyms ate them so it must be something good. I was not always as inquisitive as I am now so I would just follow their advice and eat more sweet potatoes, in addition to my other foods of course. I never got as big as some of the monsters that I used to work out with no matter how many sweet potatoes I would eat. What was the deal? Well some of them had really good genetics and some were juicing, but the conclusion that my younger self eventually came to realize was that sweet potatoes were not the magical growth food that they made it out to be. Fast forward to today and I still incorporate sweet potatoes in my diet but gone are the lofty expectations I had as a kid. The fact is that sweet potatoes are a good carb source and should be a part of your diet… unless you are cutting your carbs. I’ve covered a few good carb sources in some of my previous articles such as oatmeal, rice, and quinoa. Sweet potatoes are one of my favorites though. I enjoy the taste and popping one in the microwave is a lot quicker than waiting for a pot of rice to cook. In this article I’ll discuss the health and bodybuilding benefits of sweet potatoes and compare them to regular potatoes and yams. Sweet potatoes are a tuber that are native to Central and South America but are used throughout the world today. There are many varieties of sweet potato but in the U.S. the two main types are tan skinned with a white interior and a copper skin with an orange interior. The other type of sweet potatoes that I have seen sold in some grocery stores is a purple sweet potato. I like this variety a lot but I personally haven’t seen it very much outside of Hawaii. So what’s so good about Sweet Potatoes? If you are trying to gain weight you will need to get carbs. 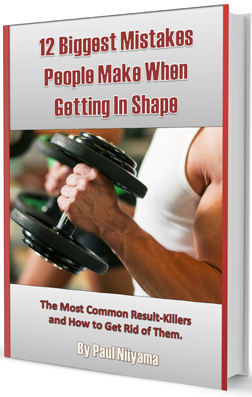 In fact, for most people who are bulking up, the largest percentage of your calories should be coming from carbs. If you trying to lose weight with a paleo diet, tubers like sweet potatoes are allowed, but if you are trying to get into ketosis, they do have a lot of carbs so they may not be the best choice. Having a low glycemic index number makes it a good food for gaining weight and losing weight (except if you are going low carb.) The lower glycemic number makes the food burn up more slowly in the body which gives you more sustained energy. A lower glycemic index number is good for weight loss because less insulin is released in the body. Insulin is a hormone that can make it hard to lose weight. As far as nutrient content, sweet potatoes have a lot of vitamin A in the form of beta carotene which acts as an antioxidant by protecting your cells from free radicals that can be harmful. The more orange color a sweet potato has the more beta carotene it will have. Sweet potatoes are also high in Vitamin B6, Manganese, Vitamin C, Niacin, Thiamin and Potassium. Sweet potatoes also have a good amount of fiber which can help in digestion and help to prevent constipation. That is always a good thing if you are eating a ton of meat for protein. I mentioned previously that sweet potatoes have a low glycemic number. This is normally true, but it can really vary greatly depending on how it is prepared. The glycemic index measures how much a food will raise one’s blood sugar and the glycemic load takes the total carbohydrates into account. A glycemic index of 55 or less is considered low. A glycemic load of 10 or less is considered low. A 2006 study measured a sweet potato boiled for 30 minutes has a glycemic index of 46 and a glycemic load of 11. This would put sweet potatoes in the low glycemic category. A separate study from 1994 measured a sweet potato that was cubed and boiled in water with a glycemic index of 59 and a glycemic load of 18. This study would put sweet potatoes in a moderate glycemic category. A 2006 study found that a sweet potato that was baked for 45 minutes has a glycemic index of 94 and a glycemic load of 42. A glycemic index of 94 is extremely high so don’t just assume that sweet potatoes are a low glycemic food. There is a big variance in these numbers as well as many other studies that measure the glycemic index of sweet potatoes. This really goes to show that the cook times and methods make a big difference on how the body will process the food. If you want your sweet potatoes to have a lesser effect on your insulin do not over cook them. I like to microwave my sweet potatoes just until they are soft. I keep checking them as I cook them so they don’t get over cooked. Sweet Potatoes may seem similar to yams when you eat them but they are 2 totally different species and have different nutrient profiles. I have been confused about the difference between the two for years. I thought yams were orange and sweet potatoes were white and purple. That’s how a lot of grocery stores label them so it must be accurate, right? Nope… they are all sweet potatoes. It wasn’t until I started doing research for this article that I really understood the difference. It made me wonder if I’ve ever even eaten a real yam. For hundreds of years Americans have been calling the orange fleshed ones, yams and the white-fleshed ones sweet potatoes. So yes, the candied yams you may or may not eat on Thanksgiving are really sweet potatoes. When you go to a grocery store… even if it says yam, it’s probably a sweet potato. To find yams in the U.S., you will most likely have to go to a specialty grocery store. This will probably be the biggest factor in whether most people would eat a sweet potato or a yam, since convenience is important. As far as the appearance, the inside of both of them come in white and purple colors. 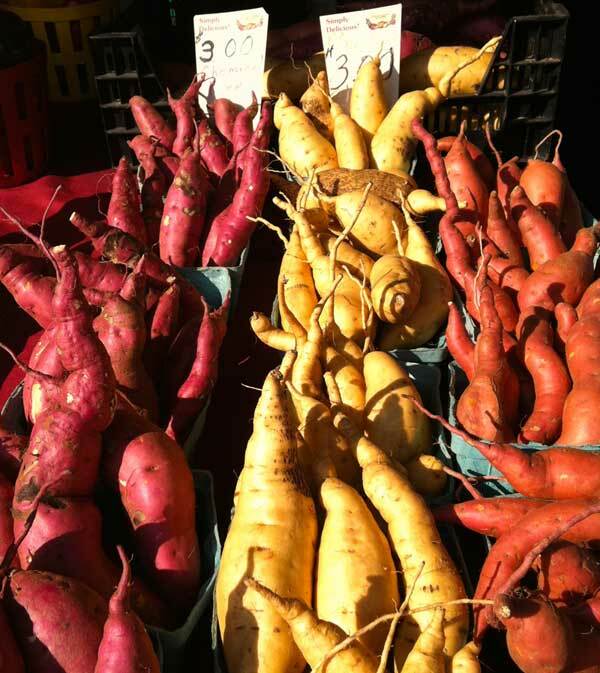 The orange flesh is unique to sweet potatoes and pink flesh is unique to yams. The first big difference in the outward appearance comes with the skin. Sweet potato skin is lighter, thinner and smoother. 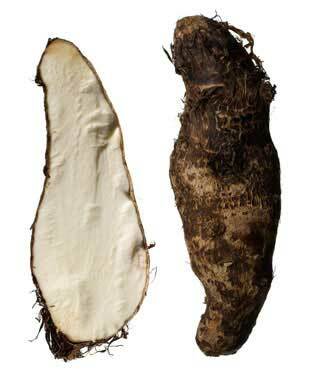 The skin from a yam is darker, thicker, and bark-like. The other big difference comes with the size. Sweet potatoes are generally around the same weird oblong shape and size. Yams can vary greatly in their shape and size. Some are around the size of a sweet potato but some can grow over eight feet long and weigh over 200 pounds. Yes… I’m just as shocked as you are. If you are looking for a good source of calories from carbs… does all it really matter if you understand the difference between a yam and a sweet potato? Not really, unless you plan on winning some trivia game at a party. Yams will have more calories per gram. These extra calories may be a big factor in what you chose. If you need more calories, get the yams. If you need less, sweet potatoes are the way to go. The other difference nutritionally comes with the vitamins and minerals each one provides. Sweet potatoes will give you a lot more Vitamin A through beta carotene and yams will have a lot more potassium. Both are low in protein and fat. Both have good amounts of fiber, but yams have a little more. Yams have more carbs and less sugar. Other than that the other differences in nutrition are pretty negligible. So which one should you choose? In my opinion they are pretty similar (other than the minor differences that I stated above) so choose whatever one you like the taste of and whatever one is more easily available to you. There are many varieties of normal potatoes that are common in a grocery store; russet, white, red, etc. Many people believe that a sweet potato is much healthier than any of them. Well as with most things, it depends on how you look at it. A sweet potato and a potato have around the same amount of calories, carbs, fat, and protein. The glycemic index can be pretty similar depending on how you cook them. Normal potatoes are generally a little higher, although sweet potatoes can measure higher if they are overcooked. The main difference between the two comes from the nutrient content. A sweet potato has a lot more vitamin A and a bit more vitamin C and fiber. A regular potato will have a little more iron, folate, and potassium. Other than Vitamins A and C, normal potatoes have more nutrients than sweet potatoes. So if regular potatoes have nutrients and can have a lower glycemic index, where did this misconception that sweet potatoes are better come from? I would have to suspect it is from the preparation methods. Potatoes are very popular when served as French fries, potato chips, processed mashed potatoes, and other refined foods. It seems that sweet potato fries have become popular on a large scale only recently. They are normally eaten whole and when they are served with sugary marshmallows as a desert they are called incorrectly called yams so people may not make that association. So what’s the bottom line? They are both good as long as you aren’t eating them as French fries or chips or with any kind of processing that will remove then nutrients The less processed your food is, the better. Baked, steamed, microwaved or any other cooking method that will preserve more of the nutrients is the best way to eat either one. Here is a quick table summarizing some of the nutritional data from the sweet potato, yam and potato. I chose to include the raw form of each food because there are so many ways to cook each one and the cooking method will change some of these numbers. Obviously this is not how most people would eat them so this chart is more of a reference and these numbers will change depending on how you cook them. Overcooking and high heat cooking can have a significant effect on the depletion of the nutrients. So while sweet potatoes may not be the mythical food that I once thought, it is still a good carb source and can be used in a cut or a bulk. Other than the extreme amount of Vitamin A, they aren’t that much more superior when compared to similar carbs like yams and potatoes. Yams are not sweet potatoes and sweet potatoes are not yams no matter what your grocery store says. Potatoes aren’t the horrible food that some people make them out to be and a diet that incorporated both will give you the different nutrients found in each. If you are looking to add carbs you can’t go wrong with any of these 3 root vegetables. Which one do you prefer to eat. Leave a comment in below or in the facebook group. Thanks for reading. If you like this article, you can subscribe to the news letter to get updates when a new article is posted as well as a few tips on working out, nutrition and health.